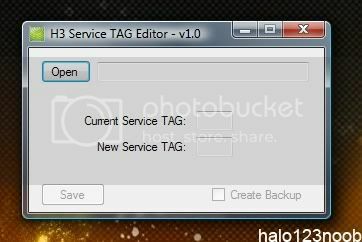 hex edit your Halo 3 service tag? Discussion in 'Xbox 360' started by SUP3RB1K3, Jun 26, 2009 with 25 replies and 1,358 views. I know that the service tag is probably saved on the your profile somewhere, and i'm sure someone here can figure out where it is and how to edit it. i just haven't seen any threads on here about this....is it possible? COD4 and 5 can do it why not H3? well, i did some testing of my own and found out its a very easy hex edit...just like the COD4 clan tag. Open up your profile in hex editor, search for your current service tag(Ctrl+f) & make sure unicode string box is checked...then you should find 2 of your service tags in a row...mine was "N55"...and it looked like ...N.5.5...N.5.5... Then you just change both to what you want your new service tag to be(make sure they match! and make sure to write over the old bits with new ones and not to add and spots that arent already there)now looks like ...P.0.0...P.0.0...now save and use the hashblock calculator and your done. what's wrong with Z17..does it mean ZIT? Awesome. N64 here I come. Yeah, same here! Thanks for the post. why are most of these "reserved" anyways? I don't see any reason people can't have A01 for example. I think they're a service tag of someone in the UNSC. Or something, I don't know. Thanks I17 is going to be sick. Is there a possibility to get banned for this? And if yes, is the possibility high? This is a Halo 3 Service TAG Editor. What this does is scans your profile and scans for your Halo 3 service Tag, Then it shows you your tag and lets you change it to what you want. 3. In current service tag, it will show you what yours is know. 4. Below in New service tag change it to what you want. 5. Check create backup, and then hit save. I didnt' use your program, but I gave thanks anyways on a good find! And as someone else said (I forgot to see who) but you could get banned for any tampering... but it's too much fun!